From Los Angeles, Regina began studying ballet under former Mariinsky Principal, Marat Daukayev. She attended the Rock School for Dance in Philadelphia and received 1st Place at the Youth America Grand Prix. 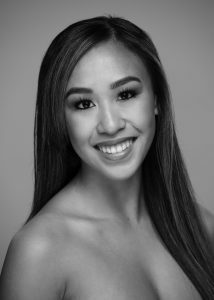 Regina joined TBII in 2013, the main company in 2014, and was promoted to Demi-Soloist in 2018. She currently heads the Dancer Committee and is the Shoe Coordinator for Tulsa Ballet. She’s been featured in both Pointe and Dance magazines and is working towards a degree in Business through TCC. Regina has performed soloist roles in The Nutcracker (Angelini), The Sleeping Beauty (Angelini), Swan Lake (Angelini), Don Quixote (Holmes), Cinderella (Stevenson), A Midsummer Night’s Dream (Wheeldon), and others. She has also performed works by David Dawson, Edwaard Liang, Alejandro Cerrudo, Dwight Rhoden, Annabelle Lopez Ochoa, Helen Pickett, Nicolo Fonte, Adam Hougland, Ma Cong, and Val Caniparoli.